The McClain varsity Wrestling team poses for a group photo on Saturday at Washington High School where the Tigers took part in the 12 team Washington Court House Bracket Tournament. The Tigers performed well and finished in second place. 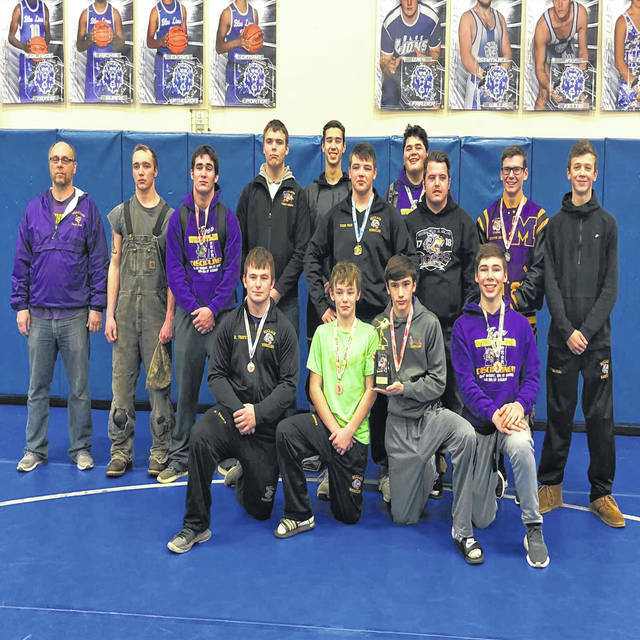 WASHINGTON COURT HOUSE — On Saturday,the wrestling McClain Tigers made the trip down route 41 to Washington High School for the annual Washington Court House Bracket Tournament. This year’s edition of the tournament saw a total of a dozen teams vie for the three team trophies. The Tigers finished as runners up, sandwiched between two division 1 teams, champions, Pickerington Central and third place finishers Little Miami. FAC member and host, Washington, finished behind Little Miami. Leading the way for the Tigers was sophomore Kade Rawlins (220), Kade pinned his way to the finals with three very quick pins. In the finals, Kade would once again square off against a state ranked opponent. Kade is ranked 17th in the state and his opponent, Mason Mustain of Washington, is ranked 18th. Kade won the first match of the year between these two 3-0 in an FAC dual at McClain back in December. That match decided the team victory that night as well, with the Tigers eeking out a 39-38 victory on that night, December 20. The rematch proved to be another dandy, with the first period ending with no score. Kade would eventually get a grip on Mustain and end the match with a pin this time. Making the finals and finishing as runners up were: Lucas Jansen (120), Quinton Smith (145), and Phil Waters (182), All three finished at 2-1 on the day. These two wins for Lucas makes him 20-3 on the season and becomes the third Tiger to reach 20 this season. The two wins for Phil were significant because they put him at 75 career wins. As a junior, he is well on pace to reach that rare 100 career win air. Finishing in third place were Ethan Burns (113) and Caleb Goddard (160). Caleb entered the tournament unseeded and was able to earn good team points and earn a medal as well. The top four per weight class, received medals. Earning their fourth place medals were Dawson Jansen (132), Kyler Trefz (195), and Kai Borrelli (285). All three split even on the day at 2-2. Aidan Salyers (126) stepped up to the challenge of earning team points by filling the open weight class for McClain at 126 pounds by bumping up from 120 pounds. Aidan was unable to earn any team points because he was eliminated in the double elimination tournament at 0-2. Placing his team before self, he fought hard and gained valuable varsity experience. The Tigers filled 10 of the 14 weight classes. 9 of those 10 finished top four and brought home a medal. All 14 of them earned the team trophy. The Tigers will be back in action next Wednesday, January 30, against Monroe and Thurgood-Marshall. The matches will take place at Washington Court House Middle School starting at 6:30pm. Those two non FAC teams will also wrestle Washington. All four teams will get two matches. The Tigers will look to reach double digits in wins. They are currently 9-1 on the year.